This installment of the Porphyra-expansion books clocks in at 17 pages,1 page front cover, 2 pages of SRD, leaving us with 14 pages of content. It should be noted that the pages are laid out for booklet-size – 6’’ by 9’’ (or A5), which means you’ll be able to fit up to 4 pages on a sheet of paper, provided your eyesight’s good enough. All righty, let’s not dilly-dally and dive right into those mysteries, shall we? This humble pdf contains no less than 5 complete, new mysteries, the first of which would be ascension, which, unsurprisingly, focuses on ascending to a nascent divinity. The class skills granted would be Climb, Fly, Intimidate and Swim and from illusion of calm to create greater demiplane, the spell-selection makes sense. Among the revelations, we have darkvision (including stacking caveat AND scaling improvements at higher levels that are tied, really smart, to alignment – evil oracles can see in magical darkness, while non-evil ones also gain low-light vision and scent – cool! ), a limited use energy blast, scaling DR (with an appropriate level-cap), natural weapons (that are properly codified – HECK YES! ), resistances, telepathy…and the ability to grow wings (which begin as humble levitate and improve to proper flight, retaining the soft balancing mechanism of flight). The final revelation provides at-will greater teleport. Immaculate, makes sense – two thumbs up! The celestial mystery nets Fly, Linguistics, Perception and Perform and focuses on the traditionally “good” spells like dispel evil and, alter, even holy sword. Sounds boring? Sounds like “been there, done that”? Well, what about infusing a small area with planar traits? Creating difficult terrain via heavenly meadows? Overcoming alignment restrictions (and undetectable alignment at higher levels?) or firing balls of sparks that can be separated into smaller blasts? This one represents a minor confusion, though: You can use more than one daily use to increase the affected area, but the pdf fails to specify by how much. On a nitpicky side, it’s electricity damage, not electric damage. Still, the options that are here are surprisingly creative! On the other end of the alignment spectrum would be the Infernal mystery, which nets Fly, Intimidate, Knowledge (nobility) and Survival. And no, it is no lame alignment-flipped version of Celestial; while planar infusion is also here, we have the ability to tap into the pits and barriers of hell, rendering targets flat-footed. We also get the ability to infuse hellish power in weaponry or cause painful bursts of hellfire – minor complaint here: Reflex should be capitalized. Nimbus surrounds you with the energy of light or darkness, focusing on a ref-fluffed array of force effects, represented, spell-wise, by the gamut from mage armor to crushing hand. The revelations include making weaponry ghost touch and indestructible by means short of disintegration. The mystery also nets a potent force-damage touch attack that can later by used as a limited use AoE-blast. The revelation also nets scaling negative conditions, though the save to negate these and halve the damage as well as the alignment-based nature of the ability keeps it from becoming too much. SPs (dark or light), scrying – as a whole, a creative mystery. Finally, there would be the pontifex mystery, which nets Knowledge (arcane), Linguistics, UMD and Intimidate – it focuses on conjuration, bonus spell-wise, beginning at summon monster I and scales up to greater planar binding. Here, things become interesting – these guys can choose the terrain control options of hell and heaven alike and even generate abyssal terrain. Constant planar adaptation, including the option to use it as an SP at higher levels and quicker summoning of an outsider subtype and limited use flexible energy descriptor changes make for yet another interesting spin here. And then there’s the bonus pdf: The Bosch Fiend, penned by Mark Gedak, a nightmarish thing reminiscent of Hieronymus’ visions. Or rather, a massive plethora of critters. You see, this is basically a “Make your own twisted thing”-toolkit, with 3 menus of abilities and 9 (!!!) sample stats provided. The bonus pdf sports 9(!!!) pages of bonus content! And I really love the critter’s concept. Seriously, worthy of being upgraded further! Editing and formatting are good on a formal level and very good on a rules-language level: While I noticed a few minor hiccups, they did not compromise the integrity of the rules. Similarly, not all wordings are perfectly smooth, but they work. Layout adheres to a 1-column standard that is pretty printer-friendly. The pdf has no interior artworks, but comes fully bookmarked for your convenience. 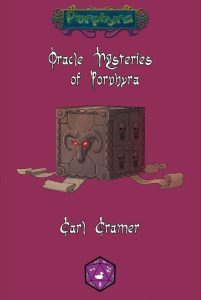 Carl Cramér’s oracle mysteries turned out to be a pleasant surprise: Theme-wise, they didn’t exactly elicit excitement from yours truly, but that changed pretty quickly once I started looking at what they offer: Instead of rehashing bland standards, the little pdf manages to generate some actually unique, fun options beyond what you’d expect. Add to that the more than fair price, the glorious bonus pdf and frankly, the minor flaws pale to the point where I feel justified in rounding up from my final verdict of 4.5 stars to the full 5 stars. You can get these nice oracle mysteries here on OBS!